Wonder Bear is wonderful … and dreamy, too! This book was put into my hands as a must-read. I was immediately taken by the illustrations – which is a good thing for a book with no words. Tao Nyeu created Wonder Bear for her thesis as a second year graduate student at the School of Visual Arts in New York. The artwork was produced using silkscreen with water-based ink. The color palate has been executed with perfect intensity making for very eye-catching illustrations – the orange and blue perfectly contrast. Now, with a title like Wonder Bear you may be wondering about the story-line. Well, this is where it gets better … Wonder Bear makes you wonder (excuse the pun). It’s the perfect book to be categorized ‘thought-provoking’. At the start of the book you see two children plant some seeds. The seeds come from an envelope featuring a picture of a blue top hat. From the seeds we see a magnificent vine grow (reminiscent of Jack and the Beanstalk), it blossoms gorgeous orange flowers, and at the top we meet Wonder Bear – a big white bear with a blue top hat. The top hat is magical. Without spoiling the fun – which would be virtually impossible – the magic involves monkeys, bubbles and sea creatures, the perfect combination for any child. 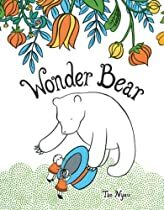 Wonder Bear will have you thinking, laughing, dreaming, and imagining! It’s a book that has many possibilities, and will be a well-loved and shared family favorite. Links: Wonder Bear – a post by Booktopia. A message to Tao Nyeu: I would love to hear about the inspiration behind Wonder Bear!